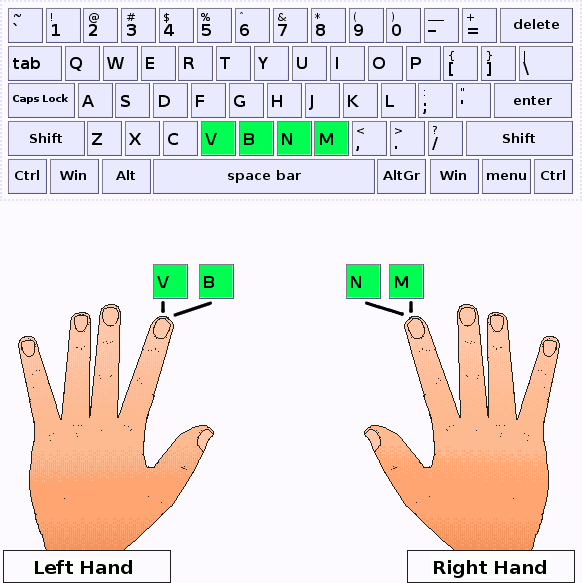 Pressing the keys V, B, N and M.
Finally, in this lesson you will learn all the keys that you could press using index fingers. As you will probably deduced, the new keys are V, B, N and M which are placed just below the home row. As in the previous lesson, you will find some trouble for pressing B key, because the movement of your left index is larger. Anyway, we give you the same advice: don't worry so much, it's a question of time for the movement to be automatic. Remember: After pressing each key, you should return the fingers to the home row.